Caseys Lane Luxury Retreat for 1 or 2 couples exclusively. Be pampered- king beds, spa, air-con, breakfast provisions to order. Walk to town from quiet Asian inspired haven amongst the trees. Private, quiet, spacious, open plan home vibrantly decorated and furnished in Asian inspired style. Full length windows and glass doors open to wide wrap- around verandahs at tree top level in a rainforest garden. Perfect for bird watching. A bottle of wine/champagne welcomes each couple and breakfast provisions to order are included in the tariff for stays up to 3 days. Gourmet kitchen includes cappuccino/espresso machine, Mezzanine library, sunken BBQ courtyard, laundry. 2 king bedrooms with walk-in robes, beautiful bedding and luxurious bathrobes. 2 bathrooms - 1 with 2 person spa and the other with bath and double shower over. Massages, private yoga lessons, picnic baskets etc can be arranged. 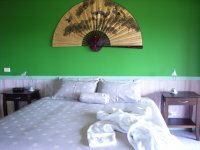 The house has 2 beautiful, spacious bedrooms with king beds and 2 bathrooms for 1 to 4 persons in your party. Bedrooms have full length glass doors and windows and open to wide verandahs at treetop level. Walk-in robes. 2 bathrooms - 1 with 2person spa and the other has a bath and double shower over.